Like every art form, musical theatre has been changing and evolving since its inception more than 2000 years ago. 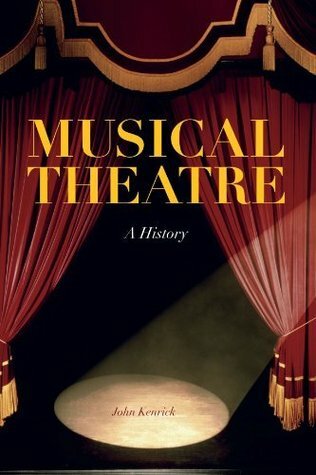 Musical Theatre: A History presents a history of stage musicals from the earliest accounts of the ancient Greeks and Romans, for whom songs were common elements in staging, to Jacques Offenbach in Paris during the 1840s, to Gilbert and Sullivan in England, to the rise of music halls and vaudeville traditions in America, and eventually to "Broadway's Golden Age" with George M. Cohan, Victor Herbert, Jerome Kern, George and Ira Gershwin, Rodgers and Hart, Oscar Hammerstein, Leonard Bernstein, and Andrew Lloyd Webber. Overall, Musical Theatre--A History is a solid work. I loved the earlier chapters which chronicled the development of musical theatre from Ancient Greece through the mid-twentieth century. I loved the detail and Kendrick's obvious enthusiasm. However, I wasn't so impressed with the final chapters, which detailed musicals from 1970 to 2007. Here there were obvious incorrect facts, and Kendrick's opinion was generally scathing. On some points I agree with him: I am not keen on jukebox musicals either, and it's true that merchandising has become a huge thing. But that's how shows support themselves in the current market. I didn't welcome some of his other disparaging comments though, many of which were inaccurate or unfair. Clearly Kendrick thinks good musicals ended in the 1970s, but it makes his comments in the final chapters highly biased, whereas in previous chapters they had been balanced and interesting. As such, I am giving this four stars. It's highly informative on earlier works, if you can ignore Kendrick's vitriol against more recent productions.